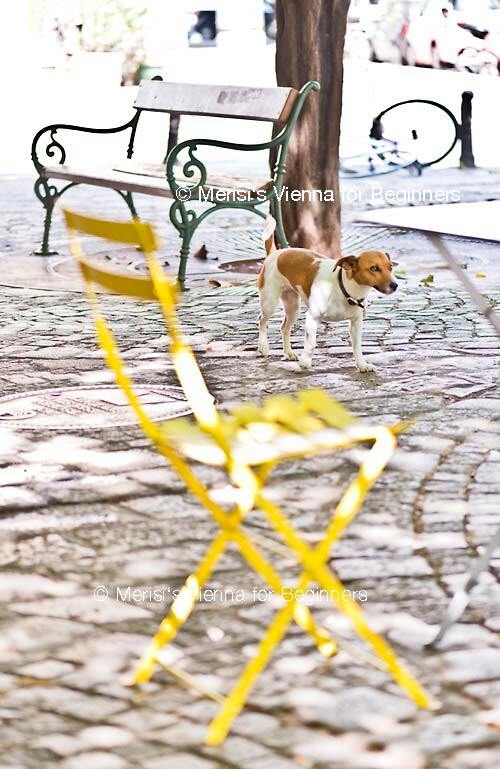 Merisi's Vienna for Beginners: Viennese Dogs Now you see 'em, now you don't! Ah, the doggies seem to be the topic for the day! Fun shot, Merisi! Hope your week is going well! I imagine that would be a perfect fit, out in your beautiful countryside. He'd never get bored! Cute dog. Looks like he's very playful. And he was very well behaved! Any commuter dogs there. I've heard of dogs taking the trains from the outskirts into the interiors to find food. cute dog ... but lets talk about the chairs! 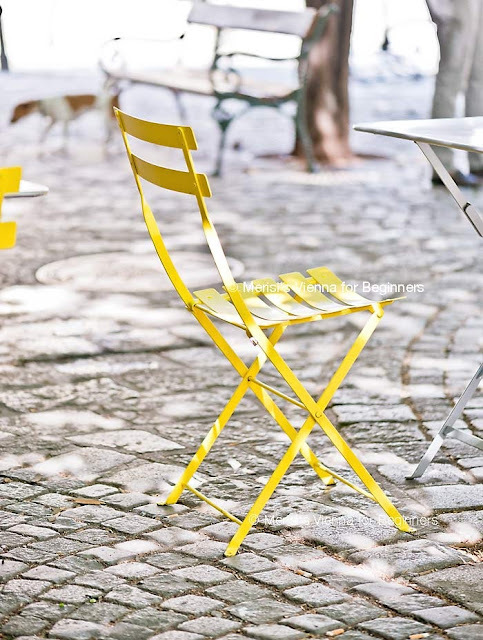 I have two in blue but I love that sunny yellow cafe chair! You can see more of the yellow chairs in this post, with pictures taken from next door's Café Ansari. What a sweet dog! I love the yellow chair, too! Add to that the tree-lined square (more of a long triangle actually), paved with quarried granite setts (in the Belgian manner, set like cobblestones), and it is a perfect setting, isn't it? Gone to fetch some coffee and Sacher tort? Very cool! Love the dog AND the chair. A very cool dog passing a very cool yellow chair! He was clearly on his way to somewhere important! Maybe he has a friend at a nearby butcher or sausage shop? I LOVE these shots! They are fantastic! Oh yes, I have seen the show, and will go there again! Cute. Fun pics and post.